If you're a Netflix customer in Denmark, you're paying significantly more for the streaming service than subscribers in other countries. Netflix charges its customers in Denmark almost twice as what it asks American subscribers to fork over every month and more than three times what Argentineans pay, a report in Quartz based an analysis from financial services company UBS reveals. The streaming giant's annual monthly revenue per user in Denmark amounts to $15.11, by far the highest in the world. Customers in Scandinavian countries Norway and Sweden are the only ones close to forking over as much money each month as the Danes, paying an average of $13.44 and $12.36 per month respectively. 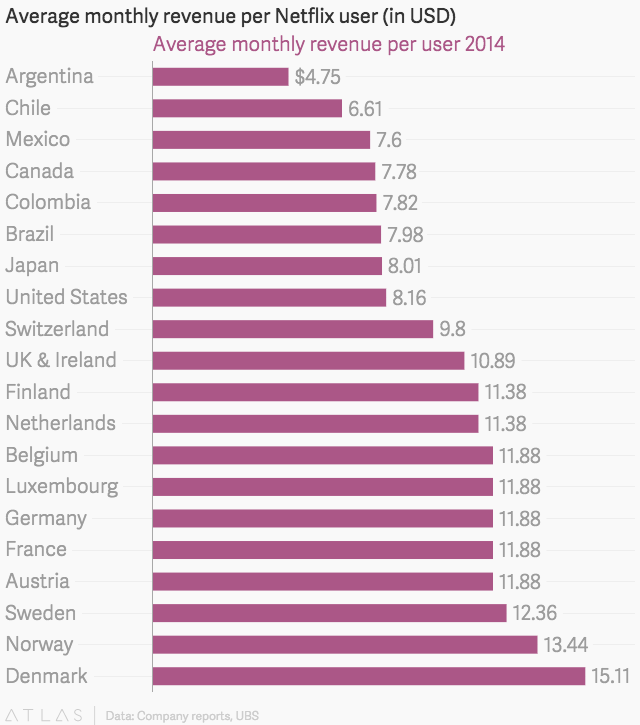 By comparison, customers in the US pay just $8.16, Mexicans pay $7.60 and in Argentina, you can binge watch Breaking Bad for only $4.75 per month, less than a third of what it costs in Denmark. Netflix offers three prices in Denmark: a basic package that costs 79 kroner ($11.93) per month, a standard package for 89 kroner ($13.44) and a premium for 119 kroner ($17.98). Despite paying significantly more for the service than customers elsewhere, Danish consumers are still frequent users of Netflix. According to the analysis institute Wilke, Netflix is the largest commercial streaming service in Denmark. Some 35 percent of Danish consumers use the service, putting it behind the streaming service of publicly-funded broadcaster DR and the free service YouTube. What next for broadcaster DR after far-reaching cuts?